Here we are with every NFL team at the half-way point or further in their season. Position groups at large have seen the cream of the crop rise to the top and teams have developed an identity on the offensive and defensive side of the ball. Being at the mid-point, its appropriate to take a look around the league at who’s playing the best football. Here, we look at the best coverage defender on each team in the NFL. Using a combination of our PFF grading and PFF Elite signature stats, we reveal who every team has been able to count on the most when defending the pass. 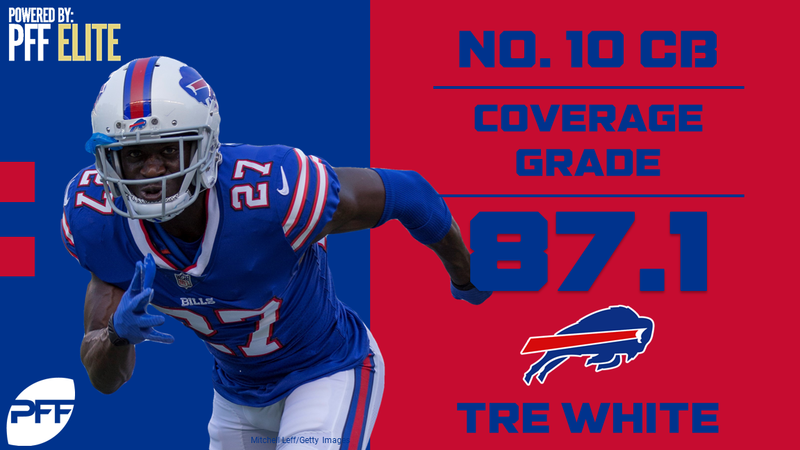 Buffalo Bills – CB Tre’Davious White – Earning an overall grade of 87.1 and ranking in the top-10 among cornerbacks, White has been sensational as a rookie. His coverage has been ultra-tight allowing a catch rate of just 50.0 percent. Most impressively, White has gotten his hands on 10 of the 48 targets thrown his way between interceptions or pass breakups, producing a playmaker index of 20.8 percent. Miami Dolphins – CB Bobby McCain – The Dolphins are the only team in the NFL without a single defender featuring a coverage grade above 80.0. However, McCain’s 78.5 coverage grade is awfully close and he deserves credit as the top cover guy on the team at this point. Mostly a slot corner, McCain ranks 10th among cornerbacks in yards per reception allowed with a stingy mark of just 8.9. New England Patriots – S Duron Harmon – Despite the Patriots loading up at corner this offseason, Harmon has easily been the best cover defender on the team. As the team’s deep safety, Harmon locks down the back end of secondary and his 85.5 coverage grade speaks for itself. Quarterbacks have only looked his way six times all season in primary coverage, just once every 47 coverage snaps which is the fourth-fewest among safeties. New York Jets – CB Morris Claiborne – The Jets brought in Claiborne to be their top guy in the secondary this season and that’s exactly what he’s been. Outside of a problem with penalties and missing some time, Claiborne has been effective, surrendering a passer rating against of just 64.4. Baltimore Ravens – CB Jimmy Smith – Through eight games, Smith is having his best season to date producing a near elite grade of 89.6 overall, the fifth-highest grade among cornerbacks. Quarterbacks would yield better results throwing the ball into the ground than targeting his coverage as he has allowed the lowest passer rating of any cornerback at 27.9. Cincinnati Bengals – CB William Jackson III – In his first real season of action, Jackson III has been brilliant at times. His Week 7 performance matching up primarily against Antonio Brown was one of the best cornerback performances of this season, earning a game grade of 92.3. When covering Brown, he didn’t allow a single catch on four targets. His 82.7 overall grade ranks 20th among cornerbacks. 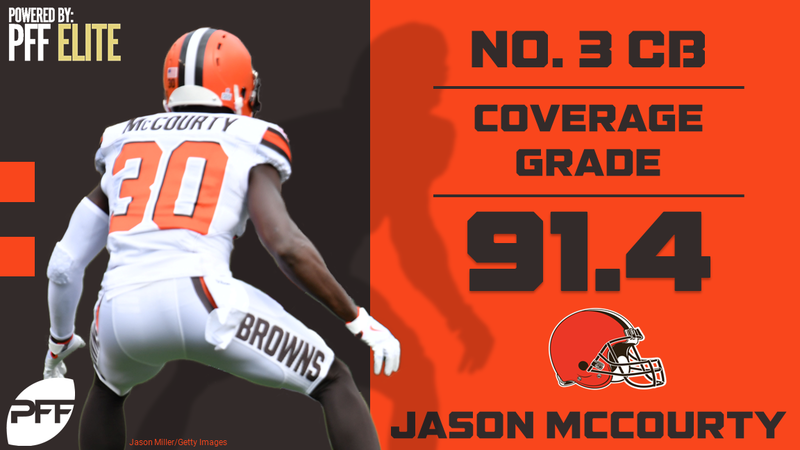 Cleveland Browns – CB Jason McCourty – At 30-years old and on a new team, McCourty is having his best season as a pro by a distance as he ranks second among cornerbacks with a grade of 92.0. Throwing his way has been a mistake for quarterbacks as McCourty boasts a playmaker index of 24.1 percent, the third-highest mark in the NFL. Pittsburgh Steelers – LB Ryan Shazier – Following the theme of the year, Shazier is also having career-season overall but perhaps more importantly has improved his coverage ability as well. His coverage grade of 85.9 ranks sixth among linebackers while his passer rating against 75.7 is the seventh-lowest at the position. Houston Texans – CB Johnathan Joseph – In his Week 6 game, Joseph picked off two passes and added another pass breakup to put up the top game grade of the season for any cornerback, linebacker or safety at 97.6. Joseph is giving up a catch every 17.5 cover snaps, only seven cornerbacks are averaging more snaps between receptions allowed. Indianapolis Colts – CB Rashaan Melvin – With 10 pass breakups and two interceptions, Melvin has been a playmaking machine. His playmaker index of 24.5 percent is the second-highest mark across the league. Melvin has played at a top-10 level all season and currently ranks seventh among cornerbacks with a grade of 88.3. 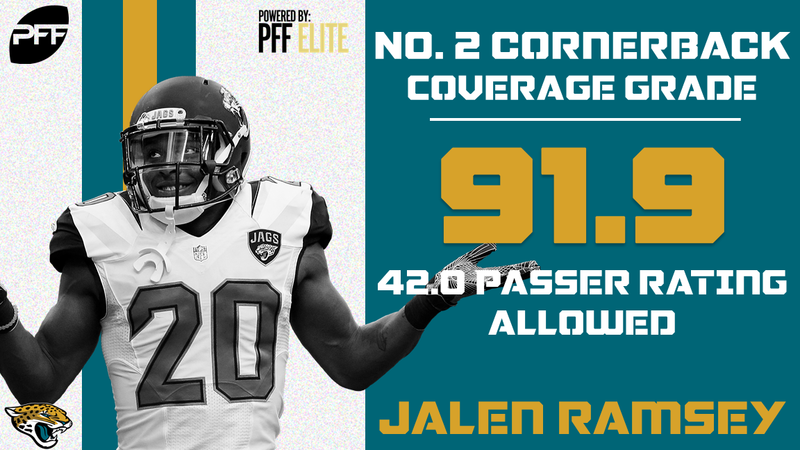 Jacksonville Jaguars – CB Jalen Ramsey – Ramsey took the leap from “very good” to “elite” between his rookie season and sophomore campaigns. Ramsey has been reliable in shutting down opposing teams No. 1 receiver all year and currently ranks fifth in passer rating allowed at 42.0 and seventh in catch rate allowed at 45.5 percent. 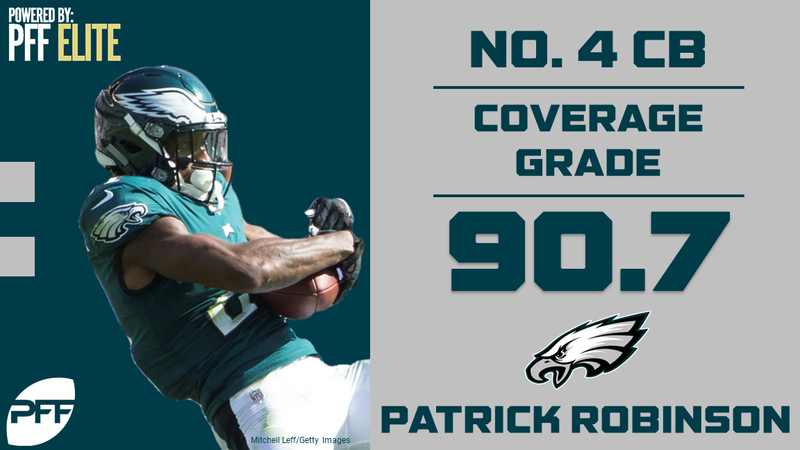 His coverage grade of 91.9 ranks second among cornerbacks. Tennessee Titans – S Kevin Byard – Playing as a deep centerfielder in the Titans defense, Byard has been the very definition of a ball hawk leading all safeties in interceptions with six and ranking second in pass breakups with four. His overall grade of 88.1 ranks fourth among safeties. Denver Broncos – CB Aqib Talib – It’s no surprise to see Talib on the list as he’s been a reliable cover corner for the Broncos for quite some time now. His 82.3 coverage grade puts him just inside the top-20 among cornerbacks and he is only giving up 0.62 yards per cover snap, which is the seventh-fewest among corners, despite being exposed at times against Philadelphia. Kansas City Chiefs – CB Marcus Peters – As suspected, Peters style of aggressive play has put him tied at the top of the cornerback chart with a position-high, three interceptions. On a defense that has struggled against the pass at times this season, Peters has been mostly solid and has a 13th-ranked coverage grade of 84.6 to show for it. 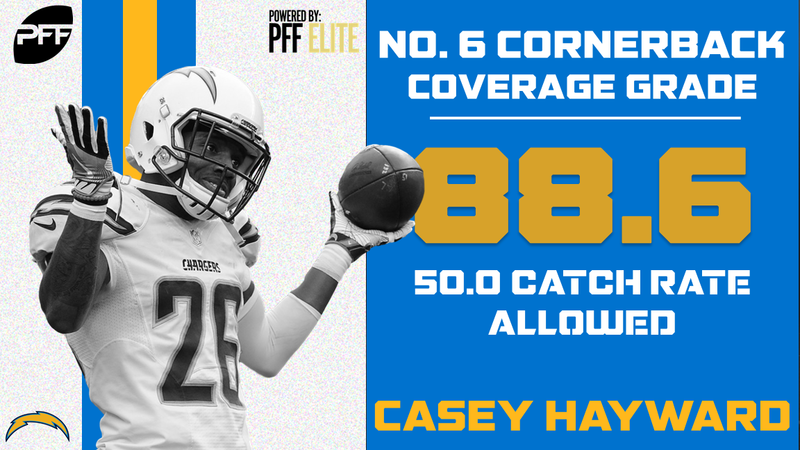 Los Angeles Chargers – CB Casey Hayward – Primarily shadowing No. 1 receivers, Hayward is surrendering a catch rate of just 50.0 percent on the season and has yet to be penalized. Week 4, Hayward churned out four pass breakups on his way to producing the second-highest game grade on the season among cornerbacks, safeties, and linebackers at 96.9. Oakland Raiders – CB T.J. Carrie – The Raiders pass defense has struggled all season long and have little to write home about. However, while manning the slot, Carrie has been a pleasant surprise earning a coverage grade of 82.0. No cornerback has more tackles resulting in an defensive success while defending the pass than Carrie’s 14. Dalas Cowboys – S Byron Jones – Despite being part of a struggling Cowboys back end, Jones has been solid in coverage producing a coverage grade of 81.7. The Cowboys line him up all over the defense and when lined up in the slot, Jones is surrendering just 0.67 yards per cover snap, the sixth-lowest mark any player with at least 55 cover snaps in the slot. New York Giants – CB Janoris Jenkins – Yet to allow a touchdown on 42 targets this season, Jenkins has been the loan bright spot in a struggling Giants secondary. Jenkins is allowing just 57.1 percent of the targets thrown his way to be caught. Philadelphia Eagles – CB Patrick Robinson – In his first year with the Eagles, Robinson has been a shutdown corner allowing just 56.3 percent of targets into his coverage to be caught. His coverage grade of 90.7 ranks fourth among cornerbacks. Washington Redskins – CB Josh Norman – Norman has given up next to nothing all season and is only allowing a reception every 22 cover snaps, the fourth-lowest rate among cornerbacks. His catch rate allowed of 45.0 ranks sixth while his yards allowed per cover snap ranks 10th. Chicago Bears – S Adrian Amos – Leading all safeties in coverage grade at 91.4, Amos has been elite seemingly all season. While in coverage, Amos also leads safeties in tackles resulting in an defensive success with 12. Detroit Lions – S Glover Quin – The back end of the Lions defense has carried them so far this season and Quin is the center of that success. His overall grade of 91.5 ranks third among safeties. Targeting him has been a big mistake as he has picked off three of the nine targets thrown his way. Green Bay Packers – S Morgan Burnett – The Packers had been without Burnett since Week 5 but saw his return to action on Monday night against the Lions. Playing a traditional box safety role, the Packers like to move Burnett around and on 60 cover snaps lined up in the slot, he has surrendered just 0.62 yards per snap. 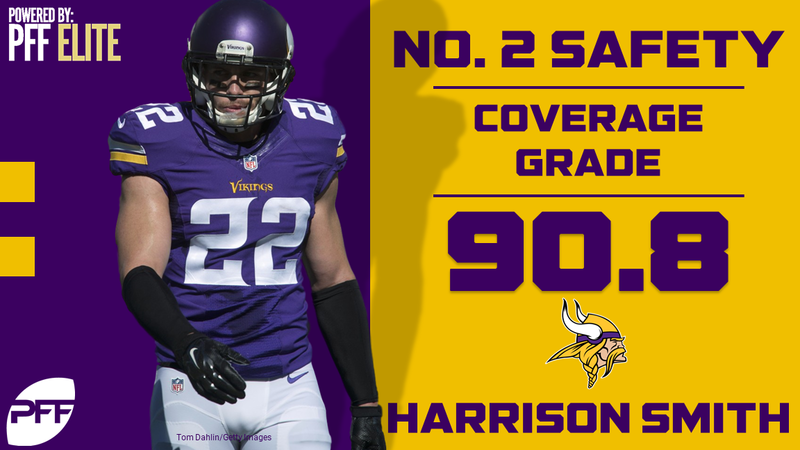 Minnesota Vikings – S Harrison Smith – Smith is the highest-graded safety this season with an overall grade 93.7. He has been a playmaker on the back end of the Vikings defense notching three interceptions and two pass breakups on just 23 targets into his coverage. Atlanta Falcons – LB De’Vondre Campbell – Part of a stingy coverage duo at linebacker for the Falcons, Campbell has allowed the third-lowest catch rate among linebackers at 63.0 percent. His coverage grade of 82.3 ranks 13th among linebackers. Carolina Panthers – LB Luke Kuechly – Allowing the second-lowest passer rating against for a linebacker at just 70.0, Kuechly is back to his usual self as a great cover linebacker. His coverage grade of 86.3 ranks third among linebackers. New Orleans Saints – CB Marshon Lattimore – Lattimore is currently the league’s highest graded rookie at 94.1 overall which also happens to be the top cornerback grade this year. Shadowing opposing team’s No. 1 receiver, Lattimore has surrendered a passer rating against of just 37.4. 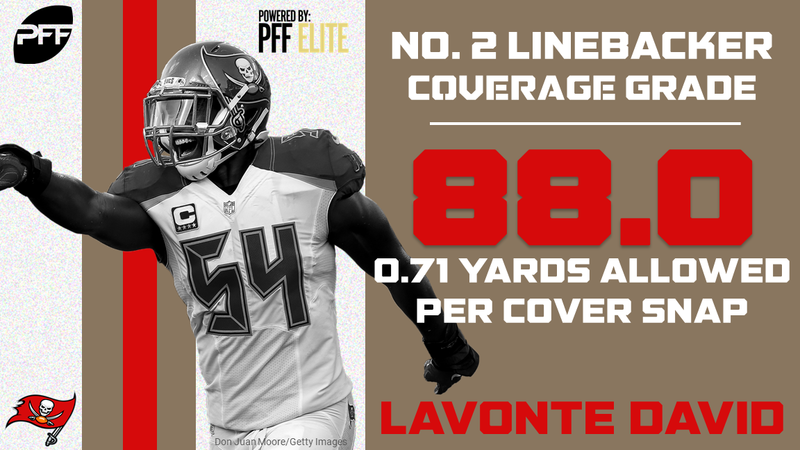 Tampa Bay Buccaneers – LB Lavonte David – Allowing 6.4 yards per catch into his coverage, the second-fewest among linebackers, David has been excellent at keeping everything in front of him. His 88.0 coverage grade ranks second among linebackers. Arizona Cardinals – CB Patrick Peterson – Clearly avoided at the position, 57 cornerbacks have seen more passes thrown into their coverage than Peterson. On the 30 targets into his coverage, he is surrendering a league-low catch rate of 33.3 percent. Perhaps most impressively, Peterson has given up just 22 yards after the catch, a testament of how tight he has covered his man. Los Angeles Rams – S Lamarcus Joyner – Making the switch from cornerback to safety this past offseason, the position he played in college, Joyner has been very impressive this year producing a coverage grade of 85.8, the 13th-highest among safeties. His 10 stops when defending the pass are the second-most among safeties. Joyner’s Week 1 game grade of 93.1 is still the highest for a safety this season. San Francisco 49ers – S Jaquiski Tart – Unfortuantley the 49ers just lost Tart for the remainder of the year but his play this season certainly deserves recognition. His 86.4 coverage grade ranks 11th among safeties and by far the best coverage grade on the team. His play on the back end will be missed. 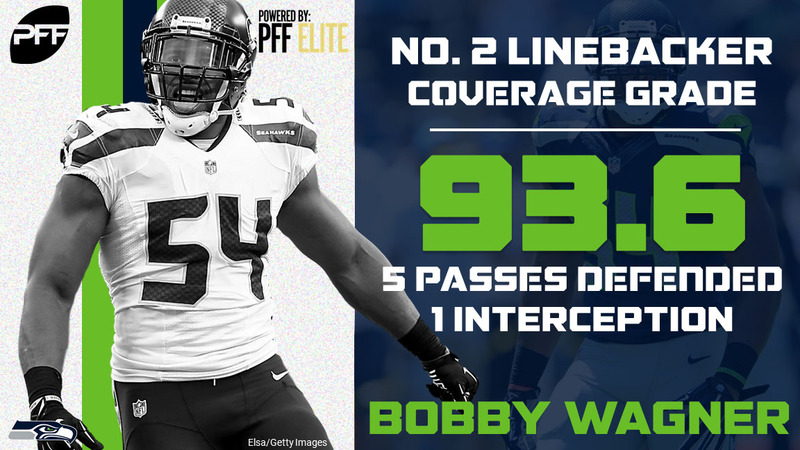 Seattle Seahawks – LB Bobby Wagner – Wagner has arguably been the best player in the league this season. His overall grade of 95.8 ranks second across all positions while his coverage grade of 93.6 leads all linebackers. In coverage, Wagner is giving just 0.60 yards per cover snap, the fifth-lowest mark among linebackers. He also leads his position in pass breakups with five.